Economic growth through entrepreneurship is the only true “win-win” economic development scenario that does not (1) take jobs/companies from an outside community or (2) use community dollars to pay out high tax incentives for business attraction. In fact, entrepreneurs create jobs with net employment growth of 8.6% (large firms lose more jobs than they create!). Entrepreneurs are responsible for 67% of all inventions and 95% of radical innovations since WWII. Cities that have invested in their entrepreneurial community have experienced employment increases of 35-71% (Littleton, Colorado; Kansas City, Missouri; Fairfield, Ohio). The one common ingredient in the success of those markets has been the engagement of large corporations (Big Cos). Entrepreneurs offer creative and responsive solutions to industry challenges, increasing the Big Co’s capacity to innovate and adapt. 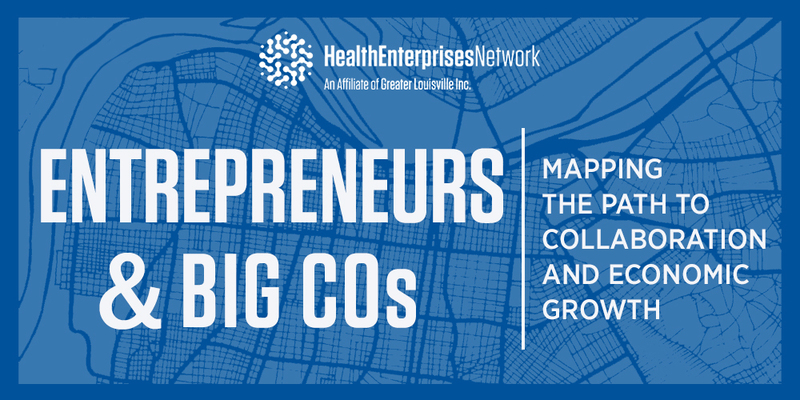 Join Health Enterprises Network on May 23rd to hear from a panel of local entrepreneurs and corporate innovators as they discuss how to navigate successful partnerships between “Big Cos” and startups. Learn the unique strengths and challenges of Louisville’s innovation ecosystem and listen as they map out strategies for effective pilot programs, contract negotiations, supply chain collaborations, incubation, and more! Experience innovative products and services from select HEN VIP companies.